Would you believe I blinked back tears in a busy church hall when this image popped up on my phone? Nathan's first t-ball game was tonight and he loved it. 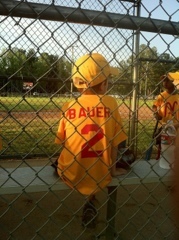 Decked out in his McDonald's cap and team jersey bearing his proud last name, he took to the field. He stood between the first two bases, with his small hands pressed firmly against his knees, watching the ball's every move. Later in the game, he dropped his bat the second it made contact, and raced to his coach, flagging him to first. He was even declared "safe" one time. :) Though they don't keep score in t-ball, I'm pretty sure we won. Or so Jonathan tells me. It was boys only for Nathan's debut on the ball field. I was in Hope with the youth, praising the Lord on His journey to resurrection. It was a pretty fair trade off, I'd say. But rest assured, there will be more games and mama will be there, cheering, hollering, and reaching for the tissues. Happy Friday, y'all!